I built myself a set of knock headphones. It took about $20 worth of parts from radio shack. It works and is plenty loud through my headphones. The sensor is a nissan sensor for many early vehicles. Found on ebay for $10 new. Now I can do some street tuning and play with the timing. I used "Afrotechmods" video on op amps to build it. If you want to build one here are a few tips for this application. You don't need to power the knock sensor so omit that part. Also since you aren't powering it the filter part can be removed. (The 0.1 uf cap and 100k resistor.) 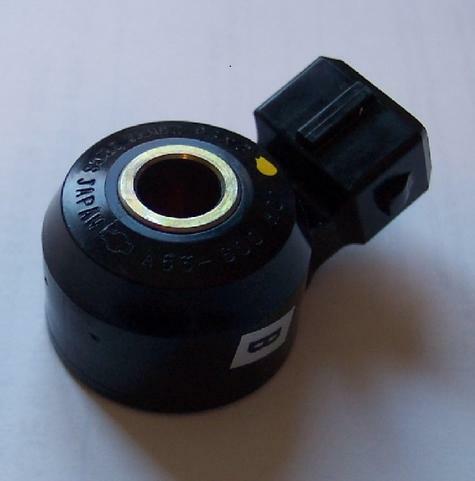 The knock sensor has a chassis ground and signal pin. The knock sensor ground goes to the 9v battery ground setup in the video. For the gain resistors just omit the second one. That sets the gain to max. In the video the second one I'm talking about goes from signal output to inverting - in. Awesome! You could wire in an LED with (what I bet is another cheap and easy circuit to build) a threshhold of whatever voltage real knock is, so when it blinks, you could listen even more closely. I think with knock, since it happens quickly, it might even be too quick to tell the difference on headphones between background noise for a single knock. That's kind of a guess, maybe it'll be super easy. I'm looking forward to your results. This is what knock sounds like. It will be easy to hear. Sweet. They had gain control knobs on that box. sweetness. Probably just a pot where the high value resistor goes in the basic circuit. I need to do this. Is there a way to actually wire in a knock gauge. I know on DSM's when they use dsm link you can turn the factor boost gauge into a knock gauge. Edited by Crazy Quest, 02 February 2012 - 07:26 AM. LEDs that come on at different voltages. I'll do a couple tests this afternoon. I'll let you know what I come up with. This should be a sticky in the MPI or Engine Mods section. Good post. I can make up a complete circuit wiring diagram and parts list if anyone wants to build their own. Before making each connection wipe the soldering iron tip on a wet rag. This cleans the tip. Also try to get an iron with a small tip around 1/16". I'm going to test this on my car this weekend just to make sure it works on the car. I tried it today and got alot of background noise. I had it bolted to the head and I could hear the valves. I'm gonna try again with the sensor in the stock location. I bet that will clear up the noise. I would have tried it sooner but everything was hot so I couldn't switch out the stock sensor without burning myself. I'll try again tomorrow. I'd suggest using the stock location for the knock sensor--who better than mitsubishi to know where to put it to begin with? Otherwise it's like having an in-car automotive stethoscope. That's why I just tapped into the stock knock sensor circuit on my Focus. Great write-up and info though and thanks for posting your method. When I get my car back from paint an body work I'll probably try to do what I did before and go through the radio etc for those of you who don't want to use the headphones. If you don't mind, UCW, I'll post it here eventually? Post it here if you want polarisman. That will keep all the info in the same place for people to read. My amp has a headphone jack so it plugs into the radio easily using a tape converter or an aux input. I'm gonna do a video of it in the car playing over the stereo when I'm done with repairs. I just have to wire up the new knock sensor and change out my IAC. The current one isn't working right. But I have to remove the upper intake to do it. I would have had it done yesterday but my roommates lebaron had a water pump failure. I had no idea how buried the water pump is on a 6g72. Does the new knock sensor have the same thread pattern as the stocker does? I'd gladly switch one out for the other seeing as how all the wires in my car are junk and I'm gonna have to pretty much re-wire the whole thing. No, my new knock sensor doesn't have threads. It just has a hole. Many cars use this sensor. Some have different connectors but the sensor is the same. This is the nissan version and can be found on ebay for $10 new. It's also the same sensor that professional built knock headphones use. Edited by ucw458, 05 February 2012 - 03:07 PM.